Abstract: Persian manuscripts on firearms reveal valuable information on casting bronze cannons, using rockets in warfare, the function of howitzers, mortars and cannons, cannon formation, etc. 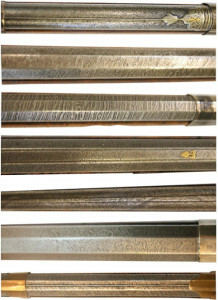 The barrels of Persian muskets show a variety of beautiful patterns of welded steel. But there are almost no period Persian manuscripts which report about the making of these beautiful pattern welded steel barrels and also their corresponding names in Persian. There is one Persian manuscript titled Tārix-e Delgošā-ye Ewaz (The Delightful History of Ewaz) which provides valua-ble information on some types of welded steel patterns. The following article deals with the chapter on firearms in the mentioned manuscript. Keywords: Persian guns, Persian muskets, pattern, welded steel, crucible steel, patterned crucible steel, patterns of welded steel on barrels, Ewaz as gunmaking center, gun-making factories.